Abstract: Designed and built with the reseller, memory manufacturer and computer service center in mind, this is the Ramcheck memory tester. By its' very precise nature, memory can be influenced by its surroundings in ways which can equate to decreased performance and reliability. A few obvious influencers are of course module temperature and clock frequency, but at lest one other factor surfaced during our tests of a few SDRAM sticks. Interestingly, the way memory modules are inserted into the DIMM slot, the quality of the DIMM socket, and the quality of the module PCB can all influence the performance of memory very substantially. 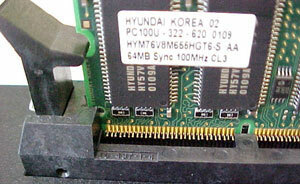 In the case of the Ramcheck the differences in memory module PCB quality were emphasized rather than shortcoming in the Yamaichi 168-pin socket (IC438-1-1). What we observed were seemingly unrelated differences in a particular stick of memory that would alter the results of the Ramcheck's tests for no apparent reason. The only change in the test procedure was the removal and reinsertion of the memory module into the DIMM socket. Otherwise, all settings were left the same. Still, some 168-pin modules would generate outright errors, while others could be tested in the same fashion and return entirely consistent results from test to test. What would be causing a few 168-pin modules of memory to generate such inconsistent results? The answer as we discovered, was due to the minute difference in the tolerances of the underlying PCB, the green coloured fiberglass backer with copper trace lines supporting the TSOP-II memory chips. Apparently the differences in conductivity between the connector pins and the socket pins is to some degree relative to the force between the two. In some instances we were able to recreate memory instability by just installing the memory module in the socket with a small force towards one side. Depending on the tolerances of the PCB, and to what thousandth of an inch the PCB was thick, or long, there would be minor differences in the electrical conductivity between socket and pin. In a few instances of generic memory, the variances in electrical conductivity were large enough to cause the memory module to fail the test with error bits. By the same token, the problematic parameters were so variable that installing the same stick with slight force toward the other side of the socket could cause no issues whatsoever. It was interesting to see the results of lower quality PCB on the performance and stability of a stick of SDRAM and the only advice we can give you is as follows. Look closely at the left, right, and bottom edges of the PCB. If it has been machined flat you are probably looking at some decent parts. If on the other hand it is not totally flat, or appears as though the PCB may have been scored and broken clean, then you are probably looking at a lower quality part. Keep in mind that is a rough guide line and won't hold true for ever instance. Also, since there is no quick and easy way to measure the thickness of the PCB and gold plated copper trace lines there is no real simple way to gage quality there. Of course the other end of the spectrum is true to. If the motherboard manufacturer uses a less expensive socket with lower tolerances or less than ideal gold plating on the contact then you may also be fighting some problems that not stick od DRAM will be about to circumvent.